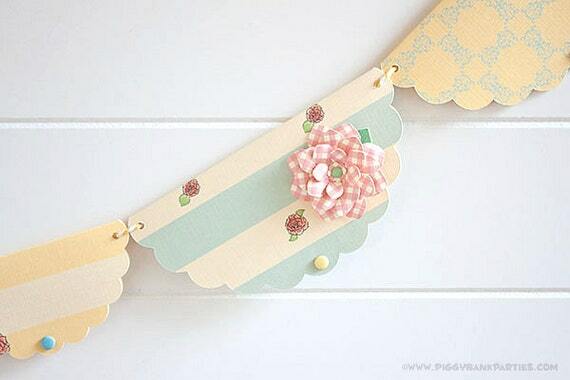 Our Shabby Chic Rose Garland adds the perfect vintage and rustic touch to birthdays, baby showers, anniversaries, bridal showers, tea parties, weddings, nurseries and more. The possibilities are endless! • If your event is less than 2 weeks from today's date, please contact us PRIOR to ordering to confirm we can accommodate your event date. Don't see the garland you'd like in our shop? Click the "Ask a Question" button to request a custom garland. 1. Add the listing to your cart. 2. Choose your shipping method and checkout. This product is for PERSONAL USE ONLY. You may not mass produce, share, sell or distribute the file(s) or the finished product(s) produced. All products are for non-commercial use. All files are copyrighted and password protected. You may not alter the artwork or designs in any way. Copyright privileges are not transferable. All rights retained by Piggy Bank Parties.